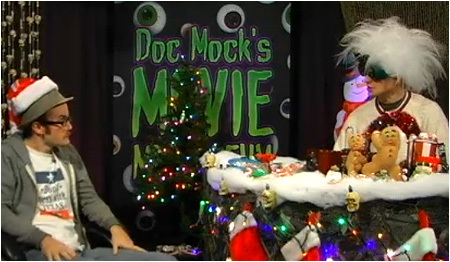 Doc Mock’s Christmas Holiday Special Airs LIVE Tonight @10pm PST! Alright guys, this is it! Our final episode of the 2009 season, the big Christmas Holiday Special of Doc Mock's Movie Mausoleum airs LIVE tonight (12/18/09) at 10pm PST / 1am EST, so I hope you can all catch it! We have a bizarre Christmas flick to show, some great guests lined up including a surprise mystery guest who's even a mystery to me and more! We'll still have the set all decked out for Christmas along with our festive outfits for the holiday season! And don't forget, we'll be judging all the entries from the Christmas Art Contest too, so if you haven't already submitted an entry, be sure to post it pronto! Hope to see all of you in the chat room as usual! If anyone reading this missed this live, it was the best ever. At least watch the recorded version. It was PURE epic. And complete hilarity. Heyyy... if it airs live, then how did you get the screenshot? That screen shot was from last weeks show. it was fantastic! Best ever! Previous post: Christmas Art Contest Ends Tomorrow! Next post: The Big Christmas Holiday Special!